The Sony Cyber-shot DSC-G3 is a WiFi-capable digital camera that aims for compatibility with the maximum number of hotspots courtesy of an included web browser. Based around a 10.1 megapixel Sony SuperHAD CCD image sensor and a Carl Zeiss Vario-Tessar branded 4x optical zoom lens, the Sony G3 offers a maximum aperture varying from f/3.5 to f/4.6 across the zoom range. The Sony DSC-G3 forgoes any form of optical viewfinder in favor of a whopping 3.5" LCD display with an unusually high 921,600 dot resolution. Tech features on the Sony G3 include Face Detection linked to both the autoexposure and autofocus systems, and capable of differentiating between (and prioritizing towards) the faces of children and adults. There's also an Intelligent Scene Recognition function that can identify and automatically switch to the settings for one of eight common scene types - backlight, backlight portrait, twilight, twilight portrait, twilight using a tripod, portrait, landscape or macro. 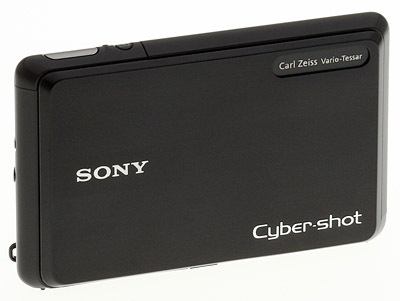 The Sony DSC-G3 can also identify when your subject blinks, warning you when this is the case. A Smile Shutter function can trigger the shutter automatically when your subject is smiling, while Sony's Dynamic Range Optimizer tweaks exposure and contrast to prevent lost detail in highlights and shadows. 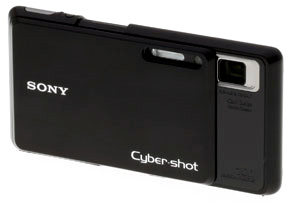 The Sony Cybershot G3 stores images in 4GB of internal memory, as well as on Memory Stick Duo or PRO Duo cards. Power comes from a proprietary Lithium Ion battery, and the WiFi networking is supplemented with NTSC / PAL video and USB 2.0 High Speed computer connectivity. Given the generous memory, the G3 can function as a pocket photo album and includes the ability to organize, browse and search through large quantities of images in-camera. The big story about the Sony G3, though, is its WiFi connectivity. Where previous efforts in this area have generally been aimed at connecting solely to open public hotspots, home wireless LANs, and perhaps a subscription WiFi service with an initial free period, Sony has gone a step further for the Cyber-Shot G3. 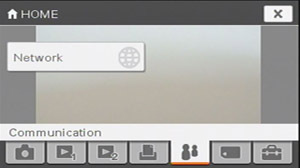 The inclusion of a full web browser means that users can connect to wireless hotspots that require the user to acknowledge a "terms and conditions" page, or to connect to paid hotspots other than the brand chosen by the camera vendor. It also means that it is possible to browse websites other than those specifically implemented for the camera, although Sony was not describing the G3 as intended for general web browsing purposes. Once connected to a wireless LAN, the G3 allows users to quickly upload images and manage albums with a minimum of fuss through what the company is calling an Easy Upload Homepage. This page offers links to partner sites - currently YouTube, DailyMotion, Picasa, Photobucket, and Shutterfly although it is possible that further partners will be added later (and indeed, since Sony hosts the page on its servers, this can be done without requiring a firmware update in the camera itself). It is also possible to browse albums from the camera, although users cannot download and save images from their albums back to the camera via the WiFi connection. Sony has partnered with AT&T to offer free access via the company's hotspots until Jan. 31, 2012. As previously noted, it will also be possible to connect to other paid or free hotspots during and after this period. The Sony Cyber-shot G3 is on sale now, priced at US$500 or thereabouts. The $499.99 G3 is not just another sweet Sony ultracompact. It is certainly sweet and it is ultra compact. And I'll bet you can't get through the next two paragraphs of to-kill-for specs without dabbing at the tears in your eyes. But what will make you scream is how Sony implemented WiFi. Unlike Nikon, they haven't crippled the WiFi connection to mate only to their own service. Unlike Eye-Fi, this isn't just a one-way connection to upload images only. 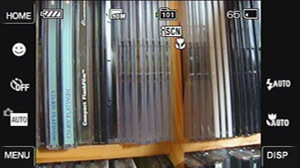 And unlike Casio, they don't just upload to your favorite service where you can browse your albums on the camera. No, Sony built a browser into the G3. It's more like an iPod Touch than any WiFi camera. (Except the iPod Touch, at the moment anyway, doesn't have a camera.) So it's a real camera with a Web browser instead of a Web browser with no camera. Look and Feel. With built-in WiFi, the Sony G3 is a bit bulkier than the stylish T-series, but its tapered sides make it seem slim as it slips into your pocket. It has some welcome heft but it won't deform your wardrobe. The front of the camera is one big sliding lens cover. And the back is completely taken over by the 3.5-inch LCD with an astonishing 921,000 pixels (the high-end Canon G10, for comparison, has 461,00 pixels on its 3.0-inch LCD). Sliding the camera open reveals the lens on the front and a thumb pad on the back with the Zoom control above it. That's it. Simple. Elegant. But there are a few controls, too. Controls. 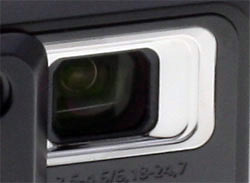 The Numero Uno control on the Sony G3 is its sliding lens cover. Except, it isn't just the lens cover that slides. It's actually the middle of the body. If you try to slip the cover open like you might with a T-series Sony, it's a struggle. You have to slide the body apart to get it to start up. Grab it top and bottom and pull. Once powered on, the Sony G3 reminded me of the Sony T700, its touch-screen older sibling. Like the T700, most of the action takes place on the 16:9 touch screen. There is a Shutter button and just a finger stretch to the left of it a Playback button on the top panel. And when you pull the body apart, you get a nice thumb rest with a Zoom lever at the top, too. But all the rest of the buttons are on the touch screen, just like the T700. It's actually something of a relief to have everything on the screen. There's no hunting around a menu system to find that command you need. When you first turn on the Sony G3, it responds to every tap with a dialog explaining what that function does and giving you the option to back out. To disable these confirmation dialogs, turn off the Function Guide in the Main settings. While the Guide is a handy explanation for every action, it tends to explain what you already know and is mute when it comes to settings you'd like to know more about (like browser options). And turning it off extends the Sony G3's battery life a bit, which matters when you use the browser. There is an AC power port on the right side of the Sony G3, but the $40 AC-LS5K adapter is optional. That might come in handy for surfing at home or in an airport. Even more handy, though, would be another $50 battery pack (fully charged). It's a little silly to tether a WiFi device with an adapter cable. Sony claims the G3 is capable of HD output of 1080i, but they don't include a cable to prove it. The octopus cable in the box is capable of just standard definition for video (although stills get a little better treatment). For HD output, you need the $40 HD Output Adapter Cable VMC-MHC1 to plug into your HD -- and that's component only, no HDMI. 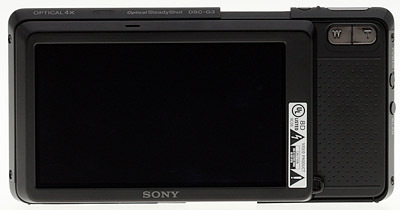 Another option is the CSS-HD2 dock available, like the CSS-HD1 we reviewed (https://www.imaging-resource.com/ACCS/CSS/HD1.htm), and the Sony G3 does include a dock insert for it. The printed manual that comes in the box isn't quite as expansive as the PDF Handbook on the CD. You'll want to use the Handbook with its easy search feature to answer most Sony G3 questions. Lens. The Sony G3 has what appears to be the same 35-140mm 35mm equivalent 4x zoom as the T700. As our test results note, "Lens quality is about what you'd expect, with some softening in the corners at both zoom settings, and moderately high chromatic aberration. Pincushion and barrel distortion are also on the high side." That's common with ultracompact zooms. The Carl Zeiss Vario Tessar lens features 12 elements in 10 groups including four aspheric elements and one prism. The 2x digital zoom makes it a total 8x zoom. The Sony G3 also enjoys Sony's SteadyShot optical stabilization for improved low-light captures. Aperture ranges from f/3.5 to f/10 to go with shutter speeds from one second to 1/1,000 second in Program Auto. Modes. One of the nice things about the Sony G3 is how well it handles intelligent scene recognition. Many cameras now claim to be able to automatically recognize the scene you are shooting and optimize settings for the situation. They can, for example, tell whether you're shooting a close-up, a landscape or a portrait. Of course, most of them do this so slowly that you are inclined to do it yourself. But the Sony G3 can distinguish up to eight different scenes (Backlight, Backlight Portrait, Twilight, Twilight Portrait, Twilight using a Tripod, Portrait, Landscape, and Macro) and it can do it quickly. You'll also find Program Auto (which lets you change anything that can be changed on the Sony G3), Auto (which doesn't), and Easy Shooting (you can only change Image Size, Flash modes, and the Self-Timer). And the Sony G3 includes a nice selection of Scene modes, too. Those include High Sensitivity, Landscape, Soft Snap (for portraits that are kind to wrinkles), Twilight Portrait, Twilight, and the more specialized scene selections Beach, Snow, Fireworks, Underwater, High Speed Shutter, and the new Gourmet Mode, which slips into Macro mode for mouth-watering food photography. I don't understand why Sony, of all companies, still doesn't offer an HD Movie mode. VGA quality (640x480 at 30 fps) is the best you'll get with a 16.6 fps option and a 320x240 8.3 fps alternative. You can zoom slowly up to 4x when shooting a movie with the Sony G3. I tried to zoom while I was shooting, but apparently I wasn't pressing the Zoom lever hard enough. Storage. Yes, we repeat, the Sony G3 has 4GB of internal storage. You hardly need a card. But you'll probably want to use the internal storage for your portfolio or family album. So pop a Memory Stick or Memory Stick Pro into the Sony G3. It can use a card as large as 16GB. 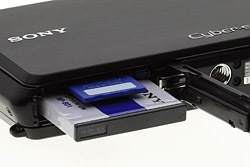 If you connect the Sony G3 to your computer using the octopus USB cable, both the internal memory and the memory card show up on your desktop. I'd recommend using a card reader to avoid that. Battery. The proprietary lithium-ion D type battery is rated at is 3.6V and 2.4wh (680mAh). The charger with folding prongs is included. Battery life is below average, unfortunately, coming it at 200 shots per charge when tested to CIPA standards. We recommend you buy a spare. Shooting Mode. Everything's on one screen. Shooting. Once I figured out I had to pull the camera apart to turn it on (instead of merely sliding the lens cover), I had fun shooting with the Sony G3. It can be disorienting at first, even if you're familiar with the T700, because there are hardly any buttons on the Sony G3. The icons are scattered all around the border of the screen and it takes a while to learn where to look for them and what they do. I spent more time than I care to confess looking for EV and ISO. On the other hand, it is nice to have everything on one screen. No tabbing, paging, or scrolling to find something. Function Guide help at the top). But once we made friends, I found myself using mainly Program mode so I could make all those small adjustments that make the difference between a disappointing shot and a pleasant one. 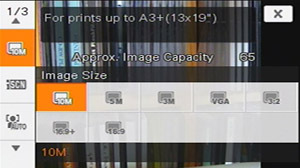 And the main adjustment I made on the Sony G3 was Image Size so I could use a 16:9 aspect ratio (there are two, one high res and the other low). That's pretty much how a point-and-shoot should operate, after all. WiFi. The real story with the Sony G3, though, is WiFi. With its 802.11b/g WiFi capability and built in browser, the G3 offers something you can't get anywhere else. A real camera with a Web browser. And that can be difficult to appreciate. So this review is accompanied not just with our gallery shots but also by three Flash slide shows (use the View option to enable slide show mode for a hands-off experience) that walk through the WiFi setup, browsing the Web, and uploading images. The slide shows let you look over our shoulder and see for yourself what it's like. The rub on WiFi cameras (and WiFi in general), after all, has always been how difficult it is to set up the WiFi connection. What's an SSID? What's WEP and WPA? What's an IP address? What's Wireless B/G/N? It can indeed be hard to connect a WiFi device to a wireless network. So how hard is it to setup and use WiFi on the G3? It was pretty easy to set up. Much easier than getting a WiFi printer connected. All I really needed to know was the password to access my router (and you don't even need to know that for free public hot spots). The Sony G3 looked around, found my network, asked me for the password and tested the connection. Thereafter, all I had to do was touch the button with my router's name on it to connect. Networking. It all starts here. Uploading was pretty easy, too. Sony says "the G3 includes complimentary WiFi access at thousands of AT&T locations across the US, including selected book stores and major quick-serve restaurant locations as well as hundreds of premium hotels and airports." For my upload test, though, I just logged into Picasa from my home network, picked a photo and uploaded it. The Sony G3 asked if I wanted to send an email to let people know I'd put something up. It has an address book to make that easy, too. Keyboard entry on the Sony G3 was a breeze, I say with some surprise. Much easier than the iPhone or iPod Touch (which tries to guess what I'm trying to type). I had hardly any typos selecting letters with two thumbs, and there are plenty of shortcuts on the high-res screen, too. Very well done. A stylus, which attaches to the wrist strap, is included with the Sony G3, but I didn't use it. I found using two hands was better than tapping around with the stylus. I did smudge up the LCD pretty badly, though. One tip about using the Sony G3's touch screen I found helpful was to use my finger nail rather than the pad of my finger tip. The hard press of a nail left no doubt about my intentions. And how about browsing on the Sony G3? Well, it's not as good as the iPod Touch, and not just because the Sony G3 isn't multitouch. There's something to be said for having a full-blown OS tucked into your handheld device. I went to my experimental site where I use all sorts of oddball code (like some cool Ajax stuff for the user interface) and the Sony G3 had a little trouble displaying it and responding to the links. I had the same problem with Google, although the simple Craigslist behaved well once I figured out how to display it. Look Familiar? 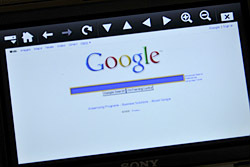 Google on the Sony G3. There are some configuration options that make a difference. The browser settings include Display mode options of Normal, Just-Fit Rendering (the default) and Smart-Fit Rendering. Normal displayed the best most of the time, but didn't function quite as well. Just-Fit seemed to function better but didn't display as well. Smart-Fit must be a work in progress. I found no documentation for any of this, so it was strictly trial and error. Some sites can detect a mobile device and display a much less complex page. I visited my local newspaper, one such place, and managed to navigate just fine. I read through an article on the rejuvenated Barry Zito, checked the obituaries (I'm still good to go), and read a few news items. As I did, I really regretted Sony's decision to put the toolbar on the top of the screen rather than the bottom where my thumbs are. I had to constantly reach over the page to the scroll up and down arrows in the middle of the toolbar. This was not only a pain when reading a long article, it also obscured the page every time I scrolled. I didn't see an option to move it to the bottom where it would have been out of the way. The bottom, though, is used as something of a status line. Which means most of the time it's not displaying anything. You do spend some time enlarging and reducing the page view but you can also scroll left and right. If a page is bigger than the screen, a very thin scroll bar appears on the right and/or bottom edge of the screen. It's thin, I think, to discourage you from trying to click on it. It isn't live. You have to use the arrows in the toolbar to scroll. Sites with frames (like Craigslist) that scroll independently show scroll bars on the active frame. Tap inside the frame you want to scroll before using the buttons. Each site you go to (apart from those you bookmark) is introduced with a page encryption dialog to let you know whether it is secure or not. If that was a good idea every browser would do it, I think. A simple lock icon in the toolbar would suffice. You're also warned that magnification and font selection are inherited from the last session. But there's no font selection I could find. A sans-serif is used for text throughout and you can't change it. Both of these unnecessary warnings amount to nothing more than a battery-draining nuisance on the Sony G3. In fact, the battery didn't survive very long browsing the Web. The Sony G3 does get warm as you browse the Web and a partially-charged battery meter can report very little charge in about 15 minutes. But here's a trick. Turn the camera off and let it cool down. Next time you turn it on, you'll have more battery. With a full charge, I got about an hour's use in two sessions. Which makes me think the Sony G3 is designed for short visits to the Web rather than prolonged contact. Actually navigating to a new site turned out to be onerous work. Tap in the URL field to edit it, sure, but there should be a quick way to delete the current URL so you can enter a new one without making you delete each character of the old one. I didn't find a way to do that. You'll want to set a home page with a very short URL if you do much browsing. The Sony G3 can browse the Web through a public hot spot and there's a nice, affordable one down at the public library. Would I be able to get on the Web there? I took a seat, pulled out the Sony G3 and started it up, tapping the Home key and then the Connect tab to bring up the browser. Then I told it to look for a new connection and it found several. It found two at the library, a protected Linksys router and the router at the rail station next door. I went through the Library setup, noting that the default button for encryption (passwords) was set to Disable. I tested the connection and it came up without a problem. So I surfed Google for a while, looking up reviews for the Sony G3. It was a pleasant experience, actually. For a while I forgot I was holding a camera. The Sony G3 felt like a handheld Web appliance. Several of the sites I visited were a mess on the Sony G3's screen, but when I found something to read, I paged through it leisurely. In sum, the Sony G3's browser is a nice proof of concept, and -- in a pinch -- probably even handy. Still, it's not state of the art, and its foibles are more than a little annoying. Are we likely to see a v2.0 of this gadget (or at least a firmware update)? Tough to say. Next up, let's take a look at the Sony G3's image quality and performance. Sharpness: The wide-angle end of the Sony Cyber-shot DSC-G3's zoom shows only moderate blurring in the right corners of the frame, with even less blurring in the left corners. 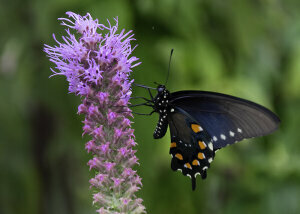 At full telephoto, blurring is stronger, but not bad for the category. Geometric Distortion: Barrel distortion at the Sony Cyber-shot DSC-G3's wide-angle setting is 0.8% which is about average, though I still find it a little too high. At telephoto, the Cyber-shot DSC-G3's 0.5% pincushion distortion is higher than average, and hard to miss. Chromatic Aberration: Chromatic aberration at wide-angle is high, with very bright magenta and cyan pixels on either side of the target lines. The distortion is also high at telephoto, with stronger red pixels, though some blurring in the corners here is intensifying the effect. Macro: The Sony Cyber-shot DSC-G3's Macro mode captures a lot of fine detail, with good sharpness in the center of the frame. 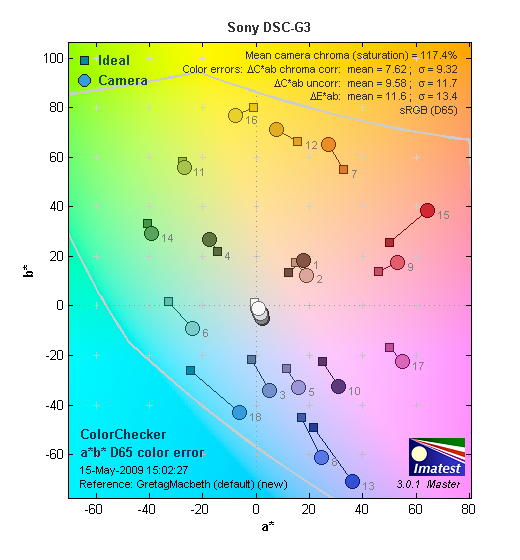 Blurring and chromatic aberration appear in the corners, though, which is common among many digital cameras. Minimum coverage area is 1.48 x 1.11 inches (38 x 28 mm). With the flash enabled, the DSC-G3 captures an uneven exposure with a bright hot spot toward the right side and stronger shadowing along the left side of the frame (uneven flash illumination is common at this distance, though, so it's not a big issue). 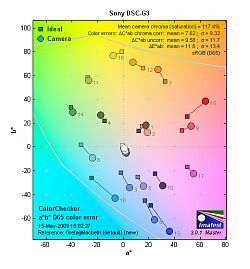 Color: The Sony Cyber-shot DSC-G3 oversaturates strong reds and blues quite a bit, which is fairly common among consumer digital cameras as many consumers like punchier color. Yellows and greens are nearly spot-on, saturation-wise, however. In terms of hue, the camera pushes cyans very strongly toward blue, while oranges are pushed toward yellow. Lighter skin tones show stronger pink casts, and darker skin tones have a warmer, more orange tone. Thus, in terms of saturation, the Cyber-shot DSC-G3 performs pretty well, though hue accuracy is a little less than average. ISO: Noise and Detail: Detail is fair at ISO 80 and 100, though even at the 100 setting, definition is already suffering from noise suppression. At ISO 200, noise pixels are more pronounced, and fine detail much softer. Things generally disintegrate from there, so that by ISO 3,200, the image is quite blurry and smudgy. See Printed results below for more on how this translates into printed images. Flash: Our manufacturer-specified testing (shown at right) upholds Sony's estimations for flash performance at both zoom settings, though the camera unfortunately boosts the ISO to compensate for distance (to 800 at wide angle, and to 640 at telephoto), which degrades image quality significantly. Printed: ISO 80 Printed results look good at 11x14 with good color and detail. If you look really closely you can see some chroma noise in the shadows, but it's not too bad. Printed at 13x19 inches, detail is a little too soft, and both luminance and chroma noise are noticeable. ISO 100 images are a little softer if you look very closely, but are still just fine at 11x14, despite our concerns when viewed at 100% onscreen. At ISO 200, detail gets softer, especially low contrast detail, but most prints will look fine at 11x14. ISO 400 shots look a little too smudged at 11x14, though. High contrast detail is fine, but large areas of limited contrast start to smear together. Printed results look better at 8x10. ISO 800 shots are too soft at 8x10, and color begins to fade. Usable detail improves at 5x7. ISO 1,600 shots are usable at 4x6, but large areas of low contrast will be softer than is acceptable to most, and ISO 3,200 is also somewhat usable, but grainy. Overall, not a bad performance from the Sony G3, better than most small folded-optic pocket cameras. Shutter lag: Full autofocus shutter lag is better than average, at 0.31 second at wide-angle and 0.39 second at full telephoto. Prefocus shutter lag is 0.008 second, which is excellent. Cycle time: Cycle time is also relatively fast, capturing a frame every 1.87 seconds in single-shot mode for large/fine JPEGs, and every 0.62 second for a burst rate of 1.62 frames per second. Flash Recycle: Sony G3's flash recycles in a reasonable 5.4 seconds after a full-power discharge. Conclusion. Were it just a plain, ordinary, ultracompact digicam, we would call the Sony Cyber-shot DSC-G3 a responsive digital camera with good overall performance. Lens quality is about what you'd expect from any ultracompact, with some softening in the corners at both zoom settings, and moderately high chromatic aberration. Pincushion and barrel distortion are also on the high side. But exposure and color are pretty good, despite a few shifts in hue accuracy. Better noise performance at the mid-range ISO settings would be nice, too. However, the Cyber-shot DSC-G3 has good performance timings, making it fast and efficient when shooting. But the Sony G3 is not just another sweet Sony ultracompact. It's a Web appliance. And even if the browsing experience isn't quite as delightful as using an iPod Touch, it works well enough to get a Google answer, check the N.Y. Times headlines or look for work on Craigslist. The Sony G3 can also handle WiFi uploads to select photo sites (including YouTube) and display images stored there as well. So you can, with WiFi access, instantly share images from an event like a wedding or a party. As long as the Sony G3's battery holds out, at least (which is why we recommend a spare). Other devices that can browse the Web don't have the camera chops of the Sony G3, something worth remembering when you evaluate our image quality comments. It's really in a class of its own, and a Dave's Pick, too.